Within every city are unseen cities, intangible walls and alleys: a voice, one afternoon on the radio, addressed its audience. Rats too are historiographers, said the voice, the voice of a rat specialist. Come hydraulic hammers and hoe rams, come rubble. Rats thread the empty plots between ghost buildings, following old paths to their nests as if the walls still stand. In this city of brick and limestone where you and I are sleeping. Every night, traversing pathways that seem no longer to exist. 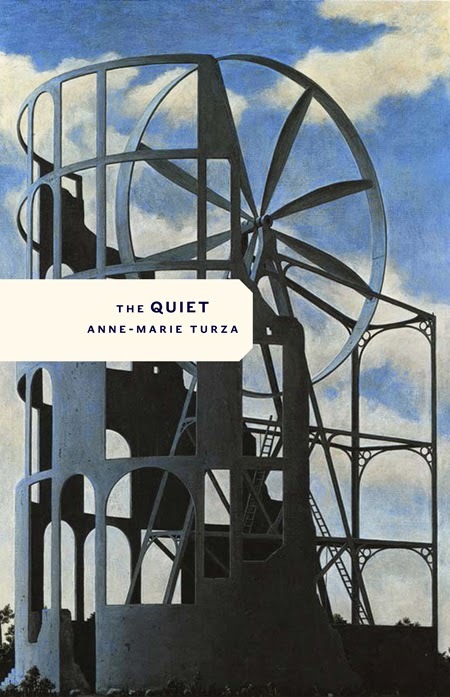 Victoria, British Columbia poet Anne-Marie Turza’s first trade poetry collection is The Quiet. Constructed in five sections, her poems delve into, among other subjects, the geography of cities and the country, science, bedtime stories, winter and doll clothing, with each piece as carefully constructed as had they been etched, or carved. The second and fourth sections of the book are made up of single-page lyric poems, with more than a couple that open with quotes from Leo Tolstoy’s Ana Karenina. The remaining three sections, each titled “The Quiet,” are constructed as extended prose-poem sequences wrapped around and through the collection as a kind of Greek chorus of lyric abstracts, composing the city as a kind of dream-state. As she writes: “A man is sewing button holes into the wings of months. / The wings tear, and the man keeps sewing. It is long ago. / The world still has an end. The man carries the moths / there. Gently. They begin their long falling.” Turza’s The Quiet is reminiscent of Italo Calvino’s Invisible Cities (1972) for the way she describes the prose-landscape of her abstract, physical places. The quiet is not unlike that long crescent-shaped lake of freshwater seals, that body of water at times blue, at times blue-green, called the North Sea in Chinese texts of the third century, near the city of Irkutsk in Siberia, lake Baikal—a lake so deep a boulder, dropped centermost, would sink the length of the CN tower once twice three times, and would still not reach the ground—there in the depths, the golomyanka, a transparent oil fish that lays no eggs, gives birth to its young, live. Above, on the surface, the fishermen sing the old chant to the wind, using its name: Hey, barguzin, drive the waves harder, we haven’t far to go. Many of the poems in The Quiet are reminiscent of the fable, akin to pieces such as the prose works in Czeslaw Milosz’ A Roadside Dog (Farrar, Straus and Giroux, 1998) for their fairytale wit, storytelling charm and twists that occasionally turn dark. These are deeply sharp and smart poems that wish to entice, impart and take the most careful measure. He swam without air elderly and east in the warrens of his veins his lungs two ton magnets in the pull of banished animals. Diplomystus brevissimus fish splay of Eocene bones prickling in his temporal lobe. Other things were there tunnelling east southeast away from him. He swam in a white nightshirt. He swam with his eyes shut. He had once pencilled a question mark in the corner of an envelope next to a bright stamp: it was printed with some kind of blue and gold flower.